Wholistic vs. Holistic – Which is Correct? 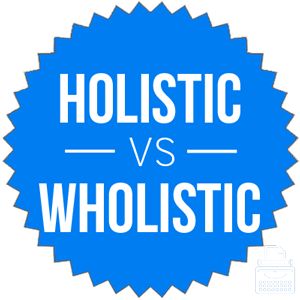 Home » Wholistic vs. Holistic – Which is Correct? Have you ever seen a sign for a holistic massage parlor and wondered exactly what kinds of services are offered there? The word holistic appears in many odd places, and it can be somewhat confusing. Despite its spelling, it doesn’t have anything to do with holes. Many writers think it should be spelled wholistic, and given its meaning, their argument makes a certain kind of sense. Still, ever since the word was first used in the first half of the 20th century, holistic has been the preferred spelling. But is wholistic a word unto itself? Continue reading to find out. What is the Difference Between Wholistic and Holistic? In this post, I will compare wholistic vs. holistic. I will use each of these words in at least one example sentence, so you can see them in context. Plus, I will show you a memory tool that makes choosing wholistic or holistic much easier. What does holistic mean? Holistic is an adjective that means dealing with every aspect of something. Holistic medicine, for example, considers the mind and spirit in addition to the body, seeing them as inseparable parts of a whole. The sentences below are additional examples. Marnie adopted a holistic approach to cleaning out the refrigerator: he threw out everything that had been in there for more than a week. Aurie opened a holistic healing practice downtown, but hasn’t healed many customers yet. Holistic has unclear origins, but according to Merriam-Webster, it was first recorded in English in 1926. Its root word, holism, was invented by a South African official to express the notion that the whole is greater than the sum of its parts. This person could have saved English writers a lot of trouble if he had put a little more thought into the spelling of his new word. What does wholistic mean? Wholistic is a common misspelling of holistic. It’s easy to see how the mistake comes about, since holistic means considering the whole, not considering the hole. Wholistic seems to make much more sense, given the word’s actual meaning, but it is a misspelling nonetheless. Holistic is the standard spelling of this word and has been since its creation. The chart below, which graphs holistic vs. wholistic in English books since 1800, clearly shows holistic is the correct spelling. This chart isn’t 100 percent exhaustive in its scope (it only deals with books), but it is accurate enough to illustrate a clear, long-term usage trend. You should always use holistic, since wholistic is a misspelling of the word. Holistic vs. Wholistic Check: Wholistic and wrong both begin with the letter W, so remembering that wholistic is wrong should be easy to do. Is it holistic or wholistic? Holistic is an adjective that means considering all the parts of something as a cohesive whole. While it seems that wholistic would make more sense, holistic is the only accepted spelling. Holistic is the correct spelling. Wholistic is a spelling error. 1 What is the Difference Between Wholistic and Holistic? Flammable vs. Inflammable – What’s the Difference? Climatic vs. Climactic – What’s the Difference?